Editor’s Note: The following review was the result of an extended email exchange between Sarah Neilson and editor Jesse Miller. For more on David Graeber, the politics of play, and assumption-making in critical thought, you can read their conversation below the review. 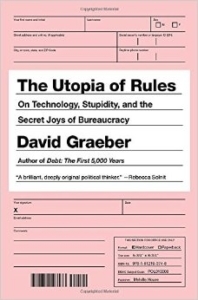 David Graeber’s The Utopia of Rules could have been the book that it’s afraid to be. His most lauded book, Debt, feared nothing. “Why should we assume a debt is something that needs to be repaid?” he asks before calmly calling into question a whole set of comfortably unexamined preconceptions about finance, money, and the moral ambiguities inherent in them. He’s also somewhat famous for having coined the Occupy Wall Street slogan “We are the 99%” while working on the ground to dismantle assumptions we have about the inevitability of wealth and power inequality in America. Graeber knows the damage that assumptions can do. And, in fact, in The Utopia of Rules he continues to emphasize — as he has done in Debt, and most of his oeuvre, really — the degree to which oppressive systems rely on mass presumption that there is no other recourse, which he does here by interrogating bureaucracy. What a disappointment it is, then, that this book of essays stands out less for the questions it asks, than for the assumptions that it refuses to question. The Utopia of Rules delivers, at first, on an invigorating conversation about a tedious practice. Its introduction is informative enough to serve as the book’s opening essay, making a strong and at times frightening case for why we need to talk about what bureaucracy is supposed to do in contrast to what it actually does. In the essay “Dead Zones of the Imagination,” Graeber challenges bureaucracy’s claims to efficiency, transparency, and the democratic treatment that paperwork promises. We are all, ostensibly, equal in the black-and-white print of impersonal forms. Except that we’re not, we’re aware that we’re not, and we’ve agreed, in what Graeber calls the “culture of complicity,” to pretend that we are. This, he argues, is how we conveniently forget that every piece of paperwork or identification we’re asked to present carries with it the threat of real force. Bureaucracy relies in part, Graeber argues, on our refusal to fully recognize its relationship to violence. Reading “Dead Zones of the Imagination” makes it impossible not to. We must make our freedom by cutting holes in the fabric of this reality, by forging new realities which will, in turn, fashion us. Putting yourself in new situations constantly is the only way to ensure that you make your decisions unencumbered by the inertia of habit, custom, law, or prejudice. . . . Change, revolutionary change, is going on constantly and everywhere — and everyone plays a part in it, consciously or not. What is this but an elegant statement of the logic of direct action, the defiant insistence on acting as if one is already free? The complete lack of argument here provides no meaningful starting points for anyone looking for a leftist alternative to bureaucracy who isn’t willing to swallow CrimethInc’s vague, self-important language. Does any new situation qualify here? Attending an evangelical church service? Going duck hunting? Joining a militia that defends against the New World Order? Accumulating enough money to go yacht racing in the Cayman Islands? Working as a doctor for leaders of the Islamic State? Graeber never posits or even suggests an answer, raising the question of whether he even intends for the reader to ask in the first place. Suppose we were to step away from the notion that these ideas are liberating, rebellious, or elegant. What’s left? What is this defying? Apparently it’s so self-evident that Graeber doesn’t feel he has to explain, since the very next sentence moves headlong into discussing strategy of movement into a world without states. We’re forced to conclude that the reader — dare I suggest the ideologically correct reader? — is supposed to feel from this passage, not come to any particular conclusions. Specifically, he or she must feel the right things. Since we can safely assume that the urgency in this tone is not supposed to come across as stressful, offensive, or presumptuous, what other emotional options remain? Inspired, I imagine, or empowered — but to do what, it doesn’t say. Considering again the words themselves of Graeber’s quote, we see that he refers to insistence, which, defiant or not, indicates an act that necessarily comes from a position of power. To accept that a group of people must — and, according to Graeber, should — demand that we behave as though we are free is to tacitly accept that we are not fully free until we adopt someone else’s image of freedom. The rigidity inherent in this condition is, then, merely an illusion of freedom: walls so camouflaged by language connoting possibility that there’s no space to ask what is actually being accomplished through this exercise. Perhaps the goal is for the reader to be swept up in the emotion that’s excited when he or she feels recognized within the rhetoric here. With such an identification in place, defiance can be arbitrarily redefined to encompass just about everything a person does voluntarily. All it takes is enough convincing oneself that any action one performs perfectly reflects the philosophies of someone whose role is, as self-created, to defy. Thankfully, the next essay, “On Flying Cars and the Declining Rate of Profit,” marks a return to Graeber’s fearless line of inquiry and the engaging prose — often dotted with eloquent humor — that distinguishes him as that rare kind of scholar who could make you want to read about paperwork. He proposes a thoroughly researched link between increasing bureaucratic requirements, labor and social control, and a post-1960s decline in scientific advancements that sought, not to further productivity, but to bring life to visions of alternative futures. A daring conversation starts back up, and, knowing that the next essay is essentially a challenge (“The Utopia of Rules, or, Why We Really Love Bureaucracy After All”), the anticipation is exciting. Where will all this lead? Here’s the thing about Graeber’s scholarship: he usually can get you interested in pretty much anything. But, in this case, if you’re not already curious how Dungeons and Dragons relates to state sovereignty, if you don’t have any intrinsic investment in the game or its surrounding subcultures, then it’s impossible to engage in this part of the discussion, because the discussion itself has derailed. Even if, as Graeber supposes, a “fantastic version of the middle ages, full of princes, knights, faeries, dragons, sorcerers, and unicorns; and eventually, hobbits, dwarfs, and orcs” did emerge as part of a nineteenth century rejection of bureaucratic demands, it really doesn’t matter, unless the reader is already looking for reasons to study and elevate the fantasy genre to something beyond entertainment. The only way that fantasy literature can, as Graeber suggests, “cause readers to question their own suspicions of bureaucratic existence,” is if you read it. What if you don’t? What if you don’t even think people should? Graeber neglects to make a case for such a reader. Are his theoretical connections expected to stand on their own, compelling because they make an unconventional case? Or — and this is a far more unsettling thought — do you have to like fantasy to dislike systemic oppression? There is no acknowledgement, here, that fantasy is part of a subculture, encompassing an ideology that may not, and should not have to, apply to everyone who reads this book. Whatever its potentially revolutionary origins, it’s also long been part of a decidedly capitalistic mainstream, one that would be hard-pressed to provide any meaningful counterpoint to bureaucracy. Graeber’s analysis of fantasy literature as antidote to bureaucracy doesn’t feel, unlike Debt, or the rest of this book, as though he’s drawing exciting connections between ideas you didn’t realize were so important. These arguments instead feel partially rooted in a hope or expectation on the reader’s part that what they already felt about fantasy and its significance is true. For anyone who doesn’t have a relationship to the fantasy genre, flat-out dislikes it, or even finds it potentially harmful, this is an abruptly alienating obstacle to what’s supposed to be an inclusive discussion. Graeber’s suggestion that “fear of play” is central to the appeal of bureaucracy implies that without this fear, we might be freer. This is not the book’s conclusion, because this book has no conclusion, but Graeber does describe his own “materialized utopianism” as “an anti-authoritarianism that, in its emphasis on creative synthesis and improvisation, sees freedom basically in terms of play.” Does play include intellectual discourse with all its attendant rigors? This ending wouldn’t be so frustrating if Graeber specified that play-as-freedom doesn’t have to look like play. As it stands, readers seem expected to get something out of the kind of overt play that appears to be free, even though any potentially ‘fun’ activity can easily become a demand. At the same time, the mundane, even the outright boring, can be transcendent in a way that theatrical play, steeped as it is in glorified self-image, doesn’t allow. People have been finding meaning in unromanticized drudgery for millennia. If we can find it today in hand-grinding coffee, tending a backyard garden that no one else can see, or chanting the Heart Sutra without fail every morning, why not in filling out tax forms? We should be debating the merits of bureaucracy, but we shouldn’t assume that the profundity of life is contained entirely within the things we have the choice to do. Sarah Neilson is a New Orleans native, currently living in Seattle and bound for Boston. She works as a freelance editor and writes a monthly column for Full Stop on America’s emotional condition. Editor’s Note: The following email conversation between Sarah Neilson and editor Jesse Miller emerged during the process of revising the above review of David Graeber’s The Utopia of Rules. The conversation is rooted in David Graeber’s work and ranges from the politics of play to the role of identity in online writing to the risks of assumption making in critical thought. Let me know what your thoughts are about this — if you want you can just send back some more informal responses here. Taking you up on the informal response offer, here’s a bit more about where I stand. I tried it. For years I was with Graeber on this point — that every time a group of vibrant, spirited people with dyed hair violated a rule or cut up a series of books to make a manifesto or practiced reckless joy in staid spaces, something was a changing. Then, I realized something: We were all a bunch of egomaniacs. We thought we were curious and intellectual and artistic and revolutionary, but we also thought that anyone with an interest in making a serious systemic change would understand instinctively what we were about, and that if they didn’t, it just showed that they weren’t ready. Ready for CHANGE is what we wanted to believe, but in hindsight, it meant ready for us. And from ready for us, it’s not such a distant leap to, ready for, MY interests! ready for MY fun! MY awesome! This brings me back to my concern, then, that what anarchist plaaaaaaaaaay is rooted in is sheer egoistic desire. Occupy Wall Street if you like, but don’t boycott Hollywood if going to see Batman would be so much fun right now. The fact that they went in, essentially, the spirit of irony, hardly affects how the box office numbers are calculated. Same with any other element of fandom or fantasy: all of this, especially now, is a bunch of stuff that a bunch of people are making a bunch of money off of. I think it’s irresponsible to talk about the fantasy genre as some kind of way out without acknowledging what a tenant of, ultimately, capitalism, it is today. Even dystopia’s been bought. If we were really, really going to act “as if we were already free,” we’d cut the cord with pop culture. Marketing would become obsolete. Marketing, of course, banks on the notion that we’ve all got personal little fantasy worlds that products can bring us closer to. Sometimes these products are people, and, in this age of self-promotion-as-career, sometimes these people aren’t even that widely famous. Graeber writes, though, as if a fantasy world is, itself, proof of independence, proof of freedom. But — and here’s a bit more of that informal reveal — I could talk at length about being trapped by fantasy, held in and held down by ideas. Graeber seems to believe that where there’s imagination, anything is possible, because the same imagination that we use to fantasize about being a knight or a rogue or a valkyrie is the imagination we use to, as he says, engage in interpretive labor: empathize with another person’s perspective, or predict their actions and concerns in order to best accomplish what must be done. But they’re not the same thing. Fantasy is, by definition, whatever you want. Interpretive labor and empathy often operate outside of what the interpreter wants, because it requires that we understand someone else, think outside of us. I was raised with a dogma that purported to value empathy, but what it ultimately came down to was, “Imagine what you would want if you were that person.” Graeber is definitely talking about something else when he discusses interpretive labor, but: I don’t think that elevating imagination and sharpening the observation and listening skills needed for real empathy necessarily go hand in hand. Imaginations are confined to the heads that they’re in: that’s their trap. Graeber seems to believe it’s their freedom: fantasy worlds are our own and can’t be regulated. But that’s where I take issue, too — he sets up an implicit dichotomy between the self and governmental authority, that leaves no room to question group authority. The implication seems to be that if you have a “good” group, a group that fights for the “right” things in the “right” ways, you don’t necessarily have to ask any more questions. I found the right group a few times. I was convinced of so many things. And what I came to understand was that I was seeking out groups who reinforced what, inside my own head, I already thought I knew. I avoided anyone who said, “but what if this is just something you like and it does nothing for the larger world and it’s just self-indulgent and pointless?” I thought, “if you don’t get it, fine.” I based my understandings of change and reality on a reverence for costumes and a passion for fairy tales and an insistence that we’ll all understand each other better if we analyze the pop culture we take in. All those things aren’t the root of all evil, but they’re definitely not how to change, and that’s the issue I’ve got here: Graeber’s writing a conversation about change, and he makes this a huge part of it, presumably because it’s supposed to help move the discussion forward in some way. In my experience, it does the opposite, because all of these things can feel like going somewhere without actually doing that. Isn’t fun just, what we like? How much of what we like relates to what we’re supposed to like? And doesn’t what we’re supposed to like go back to ideas of who we’re supposed to be, or what that represents? All this now said, though, this review isn’t about my life. It’s about a book by David Graeber, and an assumption that he made about how EVERYONE loves, or should love, fantasy. I don’t insist on anything, I just say, “he assumes.” He’s a scholar, and an adept one — he shouldn’t assume anything. None of us should. From your email, I basically got, “prove to me that Graeber loses anything by assuming that fantasy is good.” Well, he loses the acumen he so rightly gained as an incredible scholar by never assuming anything. By not even assuming that a debt is something that needs to be repaid. If we’re talking about book reviews, that should be enough. The idea that I need to put more of my personal experience into a book review in order to call someone on their assumptions is frankly infuriating and goes against what I believe in. I don’t think anyone should have to prove the right to their ideas by talking about WHO they are when they state them. An author did something incredibly, proved he could do it better than most, and thus made it clear that if he’s not interrogating something, if he is assuming, then he’s choosing to, and that’s unfortunate. That has nothing to do with my personal life; it’s a bad way to write a book. I have to wonder, too, that if you ask, WHAT’S WRONG WITH ASSUMING FANTASY IS GOOD, have you yourself never read any arguments against it that were legitimate? I’d read a whole book of Graeber’s Star Trek scholarship if he had one — or James Bond, for that matter, or Sherlock Holmes. He has an invigorating way of writing about it, BUT: It’s only invigorating if you’re already invested in some way. And already invested in some way means you’ve limited your audience. And limiting your audience, for a global conversation, is a decided handicap. I’m not against people liking fantasy — or anything else out there! But I’m against it being okay to assume that anything is inherently good. You asked me about my “insistence of the problematic nature of Graeber’s assumptions,” and what’s problematic about them is that they’re assumptions. Assumptions limit dialogue, show a refusal to ask questions, and are antithetical to good scholarship. Isn’t that common sense? As I mentioned before, I think the questioning you do of the dichotomy between bureaucracy on the one hand and play on the other is convincing. While you don’t need to mention gamification if it’s not relevant, I brought it up because your review stimulated my thinking in that direction, and I wanted to give you a sense of where a reader’s mind might go in reading this. To my mind it’s a great example of what you’re talking about, when the culture of play becomes inextricable from the culture of bureaucracy. But from what I can tell, the thing you took issue with most in my suggestions for revision was my suggestion that you make the warrants grounding your critique of Graeber’s unquestioning allegiance to fantasy and fan culture more explicit. If you don’t want to put yourself in the review, don’t do it. I offered this as a suggestion because for some writers it’s a helpful way for making their claims more concrete and because I got the sense that there was something unstated behind your critique of Graeber’s allegiance to geek culture. Certainly this argument can be made without grounding it in the personal if that’s not your thing. In the email you’ve sent me, what is motivating this particular element of your argument becomes more clear. Here’s how I understand it: Graeber’s assumptions about the benefits of play and fantasy and fandom are problematic 1) Because geek culture or pop culture more generally, in its insistence on personal pleasure relies on a problematic or egotistical conception of freedom which is actually very much caught up in the production of personal fantasy that is at the heart of capitalism and 2) That Graeber of all people should be aware of this because his career has been built upon the examination of that which is usually taken for granted. Does that sound right? If so, then that’s what I think needs to be stated in one fashion or another in your review if you want your ideas expressed in the best way that they can, according to my reading of the piece. Suggesting that you make these warrants more explicit is to suggest that if you want your argument to be accessible to people for whom it might be an unfamiliar argument, ie for those who aren’t already as engaged with Graeber’s work and the questions it raises as you are, then you need to provide these readings with more of the logical scaffolding. I think it would be difficult to find an argument that didn’t rely on assumptions — as I understand the issue you take with Graeber’s book has to do with the particular kinds of assumptions he’s making and as such the kinds of questions he is foreclosing. This is really interesting, but I don’t think it can be treated as common sense. I actually really like the gamification/bureaucracy angle you brought up, especially as a segue between play-as-demand/authority and play as whatever-Graeber-thinks-it-represents. You stated my argument really well up there and I definitely need to make that more explicit. Where we still disagree, though, is on this issue of assumptions, because it’s not the kinds of assumptions Graeber is choosing to make that I think weakens the book — it actually is making assumptions, as a practice, about anything. You say you think you’d find it difficult to find an argument that doesn’t rely on assumptions, but what kind of argument is that? It’s a specific philosophical viewpoint that accepts assumptions as inevitable AND valid. If disproving assumptions (which are so often wrong) invalidates the argument, then . . . is it really an argument? I’m guessing (just a guess! but correct me if I’m wrong) that you’re coming from a postmodern stance on this — that everything is relative, there is no objective set of moral or aesthetic standards we can all agree on, so that what ends up being evaluated is not the argument itself (which will obviously be rife with assumptions), but personal identity. What matters, in the end, is who’s making the argument; it’s the perspective that changes things. All that ultimately adds up to, though, is a variety of perspectives — which, though they can be interesting or informative in different ways — don’t actually lead, in themselves, to any cohesive ideas about change. Graeber seems frustrated, even mystified, why “cutting a hole in the fabric of reality” hasn’t — I don’t know — worked? But nothing’s going to work if we don’t actually get together and say, “here are a set of things that we have reason to believe could work,” which you can’t do if you don’t agree upon a set of objective standards. I think any worthwhile discourse about anything at all should start by tearing down our assumptions, not by accepting that we’ve all got them and going from there. Isn’t that how Fox News justifies its existence? Why should an assumption be respected? People, yes, different opinions, yes, but why assumptions? I’m bringing this up for two reasons: 1) to clarify once and for all that I really mean assumptions, all assumptions and 2) because another point that Graeber raises emphatically in The Utopia of Rules is that THIS IS NOT A BOOK OF SOLUTIONS, and I’ve really struggled in addressing this so far. On one hand, he gets himself off the hook (kind of??) by saying that he never set forth to tell us what the alternative to bureaucracy may be. But on the other hand, he’s willing to make all these other assumptions about play etc., he just won’t take it further and map it out. On Twitter he said he was careful to avoid spelling out a solution, because he didn’t want his ideas written off as oh you just think that because you’re an anarchist. He wants this discussion to be politically inclusive, then. But not, genre-inclusive? I know he’d argue that you don’t have to LOVE FANTASY in order to stand with him, but my issue is, I don’t think you could hate it. He’d probably say, “skip those essays, then,” but I really want to get at this assumption thing because I don’t think it just weakens this book. I think it’s a problem — the whole idea that some assumptions are okay to make, some assumptions are harmless, some assumptions are just for fun and are therefore okay to make/harmless. I think ALL ASSUMPTIONS are potentially harmful. Not potentially lethal, but potentially harmful. Sometimes especially where fun is concerned — because the implication is that if someone doesn’t find fun what’s assumed to be fun — there’s something wrong with them, basically, regardless of that being the intention or not. An assumption is by definition a tacit belief that your view is the normal one, the expected one, the one that makes sense. I feel like that’s relevant here. Graeber will analyze academia — that’s all over this book. But he protects his anti-institution(s) just as stubbornly as his more conventional colleagues protect their halls. There’s so much provocative stuff that’s come out over the course of these emails — and even as a flighty postmodern relativist I’ve found it really interesting and enlightening. I’m not going to tell you what to include or not, and I’m guessing you already have some ideas. If you want to run some of them by me in particular before you make further revisions, that’s fine with me, otherwise you can just make the changes and send them along. To me what seems like the most generative ideas are about assumptions which we’ve dialogued on a bit here (this might even be a way to frame the piece) and also the question of solutions (maybe a place to end?). I think of lot of times political theorizing and the humanities more generally tends away from providing solutions (I know I am guilty of this tendency) but I think you could make a real argument for why someone like Graeber does this and why it is not the only way to approach these issues.